0 Comments Posted by islandtreesadmin in Pet Health on Tuesday, November 15th, 2016. November is National Pet Diabetes Month, but with more than 50 percent of the nation’s cats and dogs overweight or obese, raising awareness of the common endocrine disease has been extended to pets – rather than just their human caretakers. It is estimated that one in every 200 cats may be affected by diabetes, being the most common endocrine condition found in felines. The numbers for dogs are similar and only expected to increase. Diabetes results when a pet’s body doesn’t produce enough insulin (Type I DM) or doesn’t process it properly (Type II DM). When your pet eats, carbohydrates found in his or her food are converted into simple sugars, one of which is glucose. Glucose is then absorbed into the bloodstream through the intestines and travels to cells throughout the body. Inside cells, insulin typically helps turn the glucose into fuel. However, when there isn’t enough insulin, glucose can’t even enter the cells to be converted into energy and instead just builds up in the bloodstream. Although diabetes can’t be cured, it can be managed so that symptoms are reduced or eliminated entirely. Your veterinarian will decide which treatment options are best for your pet. Often, changes in diet and lifestyle, combined with or without daily insulin injections, can help your pet live a happy, healthy, active life. If you’ve noticed any of the above symptoms in your pet and suspect he or she may have diabetes, contact Island Trees Veterinary Hospital today. Veterinarians are the only professionals who can accurately diagnose your pet and provide proper health management. 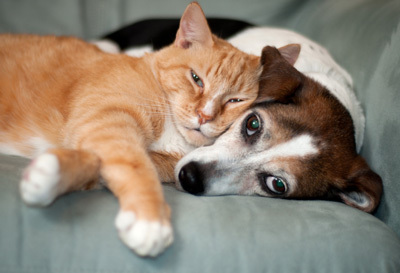 Diabetes can affect a pet differently over time, even if your pet has experienced a long period of stability. The sooner your pet is diagnosed, the better, and the less likely you’ll incur the cost of an expensive emergency visit for diabetic complications.